I did NOT. Yes to filling the chocolate mould, yes to the making my own truffles, but absolutely no to the ‘sighing in contentment’ thingie. Two-thirds of the way through lining the chocolate moulds I got bored and shortcuts were taken. The blasted truffles did not seem to stick together. My hands got seriously dirty. Chocolate worked its way underneath my nails and made me look like a dedicated gardener (reader, that could not be further from the truth). 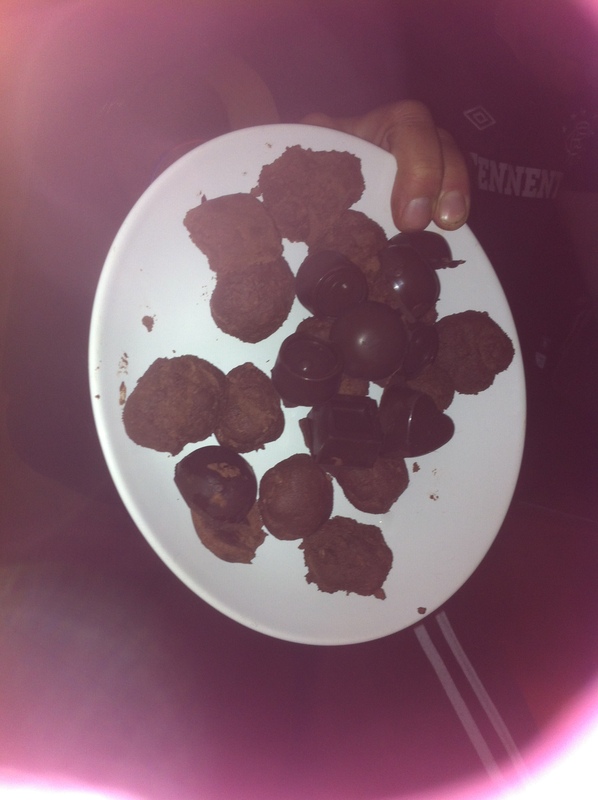 Break up the chocolate into small pieces and place in a non-metallic bowl in the microwave. Put on for 30 seconds at a time until the chocolate has melted. Stir well, add the vanilla essence and leave to cool till room temperature. Add the whisky, then use an electronic whisk to beat the mixture for five minutes until it seems lighter and is paler in colour. Cover and refrigerate for an hour or so until firm. Roll the chocolate mixture into balls (about walnut-sized shape) and then roll in either cocoa, chopped nuts, grated white chocolate or icing sugar. Eat within four days. They should be kept (covered) in the fridge. If you do make them, please let me know and tell me what you think! You can substitute the whisky for Cointreu or Bailey’s too. *I want to love whisky. It’s such a romantic drink. Think whisky, think sitting in front of a roaring log fire having hiked four or five hours up and down hills, think ancient clan chiefs sneaking the distillery away from the excise men (and Rabbie Burns was one!). Unfortunately, it still tastes pretty cough mixture to me.